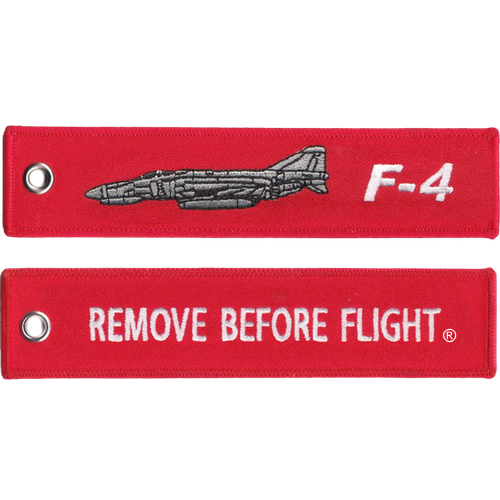 This F-4 Remove Before Flight Tag is made from a very durable polyester material, with high quality embroidering. They can be also be used as zipper pulls, or a luggage and baggage tag. If we do not have the aircraft specific Remove Before Flight Tag that you are looking for, feel free to submit a request on the items suggestions page. We can also do custom bulk orders, so you can make your own unique or personal Remove Before Flight Tag! They will require a minimum order of 100 if you want to get into our better pricing. Just submit a request on the Custom Remove Before Flight Page, we will get back to you with a quote. F-4 Phantom II Challenge Coin Size: 2.5" Material: Zinc Alloy Finish: NickelOptions: 3D, Odd Sh..